I recently read a YA novel written by fellow author, Emily Wibberley. I loved Sacrificed so much I was compelled to share the news of her launch (which is today, by the way). Emily takes a unique approach to YA by placing her characters in an ancient civilization and setting up an exciting adventure with twists and turns. I mean, there are oracles in this thing. Oracles. So cool. It is clear she has done her homework -- the details are rich and dialed in. Her characters are realistic, layered and perfectly flawed. And there's palpable tension coupled with seemingly insurmountable obstacles, which I always enjoy. I was rooting for Clio the whole time and enjoyed experiencing her metamorphosis. Also, the cover is pretty badass. Emily's debut novel comes out strong and I'm looking forward to a lot more from this author. I suppose writing is in my blood, but that doesn’t mean I didn’t have to fall in love with it too. I grew up around writers. They taught me to cherish story in all its mediums and genres. But it’s YA that stole my heart and ultimately made me want to join in the writing tradition. There’s something so uniquely beautiful about a coming of age story, more so when it’s a coming of age story targeted at those who are coming of age in their own right. I insatiably read everything in YA that I could get my hands on, and still it wasn’t enough. Sacrificed came out of so many things in my life, but what it all boils down to is this bone-deep love I have for this genre. 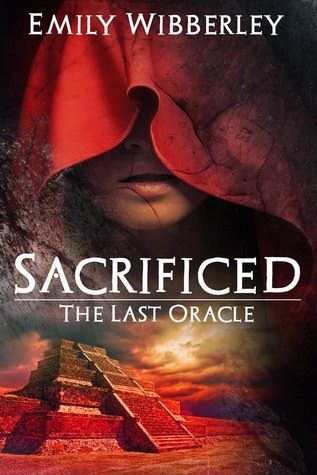 You can buy Sacrificed today on Amazon! Emily Wibberley graduated form Princeton University in June 2014. Today, she lives in Southern California with her two rescue German Shepherds. You can find out more by visiting her website: emilywibberley.com, or following her on Twitter: @Wibbs_Ink.